David Cronenberg's Spider - Movie Review - Are You Screening? There is a certain genius at work in the movie Spider, and that is a tricky statement for three reasons. 1) The movie is a solid four stars, and you’d like a more perfect product when using the word ‘genius’. 2) It’s directed by David Cronenberg, and even though I like a lot of his work, I wouldn’t have gone so far as ‘genius’ ever before. 3) It’s a difficult sort of genius. The movie itself is tricky in yet another way which is not completely unrelated to the genius aspect of which I speak, and that’s because the thing is almost impossible to review. If you’re concerned with ‘giving things away’, that is. The tricky sort of genius that’s going on comes by way of the movie giving itself away so blatantly, and pulling off the incredible feat of it not mattering to you. I’ll try to explain. Normally, in a situation like this, I might say something like, “Even from the first few minutes of the film…” But, Spider is curiously, or perhaps cunningly, giving itself away even before that. The most cursory attempt to learn about the movie will reveal that: it’s about a man with mental problems, the tagline for the movie is “The only thing worse than losing your mind… is finding it again,” and that Miranda Richardson plays three roles in the thing. You’re armed with that going in, and even if you didn’t find out about Miranda Richardson, it’s not exactly anything the movie is trying to hide while you’re watching it. Spider opens to a scene of a mass of people getting off a train. The camera ambles forward while a host of people busy with their lives tromp past. As an aside, this is a problematic opening for the movie because you’ve never seen a throng of extras that more resembled exactly that. 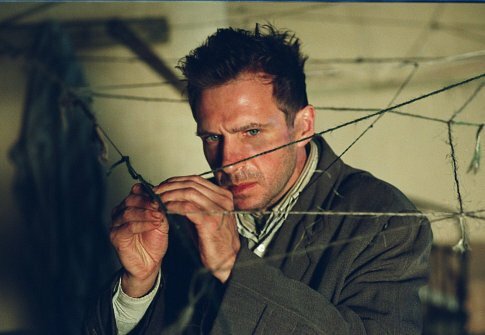 We eventually make our way toward the end of the train, and Spider, an amazing Ralph Fiennes, makes his way off the same train, and we are supposed to be struck by the depth of contrast between him, and the ‘normal’ people. He sort of putters along, mumbling to himself, and picking up bits of trash he finds. He eventually makes his way to an address he has written down, and a prototype ‘creepy, old, nurse woman’ (Lynn Redgrave -but I repeat myself-) opens the door, and tells him he has been expected. We quickly see that this is a sort of halfway house for those that may be released from a mental institution. We are also quickly given the first of many ridiculously blatant tells the movie has to offer. An elderly gentleman begins rambling at Spider, and tells him a story of a man he knew who was killed in Africa. This friend, it seems, was warned that he must never go barefoot because of the scorpions, and, naturally, this friend was putting on his shoes one day, and was stung by the scorpion that was in his shoe. Since we already know the tagline of the movie, this jumps out at us. It should be annoying. Once given his own room, Spider makes himself to home as only a truly odd duck can. The particulars of the case make this an especially difficult introduction, and it is one that is liable to turn off a good many viewers. Spider doesn’t really talk, he only mutters, and even that is something of an affront to muttering. It’s a difficult introduction, and actually it has some flaws, but it is a wonderful introduction nonetheless. It could easily get stale, but it’s pulled along by Fiennes. It’s difficult because those people, oh so long ago, who thought people didn’t want ‘talkies’ couldn’t have been more wrong. People want constant yammering whether there’s any purpose to it, or not. Imagine then a movie with a main character who never says more than fifteen total words you can make out. Spider soon begins writing (in, apparently, his own special language) in a notebook. He mutters, he scribbles, he pauses to reflect, he jots, he mutters some more. This is our link to our flashbacks. We cut to a young boy Spider (Bradley Hall, hopefully of much future work), and his parents. 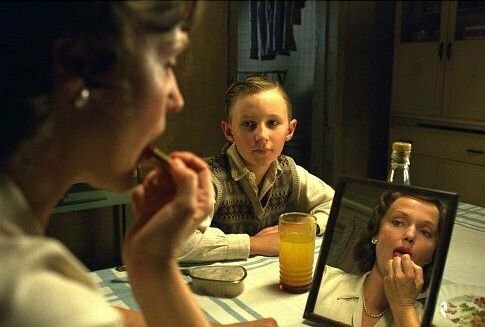 What plays out before us makes no bones at all about the fact that Spider is very close with his mother (Miranda Richardson), and is not outrageously fond of his father (Gabriel Byrne). Spider sits around the house with Mom, staring hauntingly at her with a countenance you can’t exactly label ‘wide-eyed’ only because his eyes are somehow too wide for that. Dad, on the other hand, is just the guy Spider has to go and fetch from the pub. We have to refer to these episodes as detailing, not what happened exactly, but as giving us Spider’s view of them, with all the baggage that goes along with that. Normally, of course, we would see such flashbacks as being what actually happened, but it is far too obvious this is not the case here. Not only is Spider (the one doing the remembering) a bit off mentally, and muttering his feelings at us to lead us into the thing, but he’s there himself to remind us that his skew is in effect. That is, Ralph Fiennes is in these scenes watching them happen. If there is a more clear way to try and negate our instinct to see these things as being objectively ‘true’, I don’t know what it is. You aren’t even allowed the slightest doubts on the subject, because he remembers things he clearly can’t. Somehow, we don’t mind that this is happening. The movie presses its audience to forgive, and you can’t help going along. 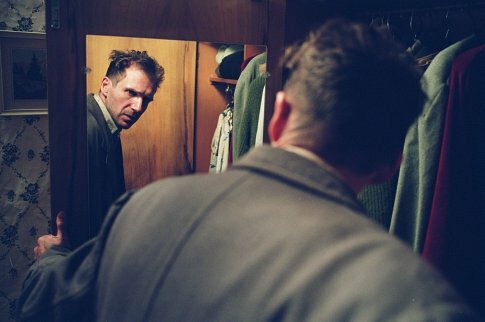 Okay, he can’t really ‘remember’ when his father started having an affair, but whether Ralph Fiennes is in frame while it’s being ‘remembered’ or not, he’s just doing something more like recounting. In the back of your mind (hell, in the front of your mind), you don’t believe yourself, but you keep playing along anyway. But, if his version of events isn’t the ‘real’ version, how far might that go? While we wade through the Oedipal overtones of these flashbacks, and try and root ourselves in a movie that obviously has a secret, but seems bound and determined to give it away, we eventually get to a somewhat settled balance. We feel like maybe we know where we’re going, and things progress enough that we manage something approaching comfort. We then move to the scene where Spider’s Mom is about to catch Dad in a compromising position, and we start to feel okay. Now we’re getting somewhere. We’ve seen them fight a bit already, and now we’re in store for the revelation of the mighty trauma that sent Spider into madness. And, before Mom manages even a moment to let her discovery of Dad’s indiscretion sink in, Dad is on his feet and promptly whacks her with a shovel. Dad and the woman he’s having an affair with, Yvonne, promptly bury Mom, and Yvonne simply comes home and takes over as Mom. But, you guessed it, Yvonne is played by Miranda Richardson. I confess to feeling that I’ve given the movie away, but there’s a lot of movie left, and did you notice where I said that Yvonne is played by Miranda Richardson? I said at the beginning that it doesn’t matter that the movie gives itself away, but maybe that wasn’t entirely true. The movie manages to convince you that it isn’t relevant (mostly by being a completely expressionistic entity), and it thus manages a surprise ending that obviously doesn’t surprise. You don’t mind, because it was a great ride, and frankly there was always that smaller unknown of exactly how it was going to play out, but by the end there is still a little something missing. At its structural base, the movie is still playing like a surprise ending movie. With something like The Sixth Sense (love it or hate it), the surprise is the whole thing. You don’t need anything after the surprise. But, when a movie won’t stop telling you the surprise all the while you’re inching toward it, no matter how much you like the thing overall, you can’t help feeling there was supposed to be something more. Surely the thing you kept forcing me to know all along isn’t all there is. Nevertheless, the movie tugs us along toward that end, and somehow manages not to lose us (to the door, or confusion). Doing most of the tugging is Ralph Fiennes. He’s so good here you almost miss it. He’s lost in this character in a way you rarely get to see, and it’s almost enough to forgive the fact that his other two same-year credits are Red Dragon, and (for the love of all that’s holy) Maid in Manhattan. Gabriel Byrne is solid as usual, especially during the critical scenes as we enter the third act. Oddly, Miranda Richardson isn’t as good as she ought to have been, but I’m not sure the responsibility there doesn’t go to Cronenberg and his slightly overdone expressionistic approach. There’s only one other person with any role to speak of, and why the moratorium on people named Redgrave hasn’t gone through yet, I don’t know. Few people in film have had more trouble convincing me they were English, and she is. Where it all becomes genius is when you realize afterward just how much you weren’t bothered by it all. When you can’t believe that a movie could have done such things, and still kept you watching, that’s when it starts to sink in. When you realize that you can never explain anything about the movie (and say it’s good) with a straight face. When you’re faced with the shock of what just happened to you. There are a lot of movies that get better after a few days reflection, a few months even. That’s not what I mean here. This one is somewhere between 2.5 and 3.5 stars while you’re watching it, but the instant it ends it’s four at least. No one could be called out for giving it a higher rating certainly, but it’s such a sharp loss mixed with the greatness that it’s as high as I can go. But, it’s a respectful, and respectable, four stars.